A man violently hit two people with his car after a bar fight early Saturday morning, Mountain View police reported. Police responded to the 1000 block of Plymouth Street at 2 a.m. to reports of a traffic collision at Sports Page Bar. Officers arrived and learned that a man and a woman had gotten into an argument with another man at the bar. When the two people attempted to leave, the suspect got in his car and drove at them, police said. The man and the woman became pinned under the suspect's vehicle as he attempted to drive away, police said. Bystanders then approached the suspect's vehicle, pulled him out of the driver's seat and attacked him, police said. 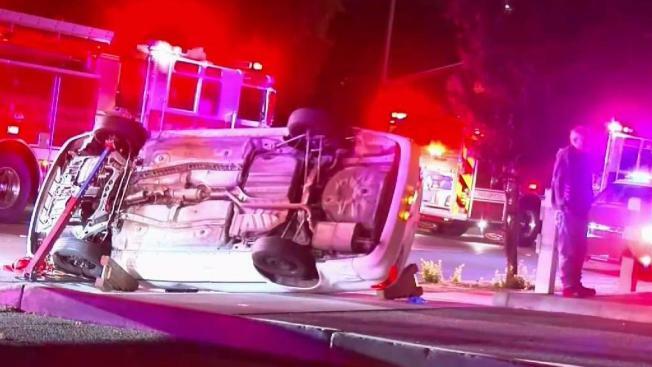 Other bystanders freed the man and woman by flipping the car over. The man, the woman and the suspect suffered injuries and were taken to the hospital. Police are still investigating the case and have not released the extent of the victim's injuries or the names of the people who were involved. Police are asking the bystanders who left the area before the police arrived to come forward. Anyone with information can contact Detective Dan Garcia at (650) 903-6624.